I called the number one Sunday morning – on Jan. 11, 2009 to be exact – and the 87-year-old man who lived in Cleves, Ohio, answered the phone with a pleasant hello. We proceeded to talk non-stop for the next two hours. I hadn’t planned to be on the phone with him that long – I figured an hour, tops – but he was such a good storyteller, had so many interesting memories to recount, that he took up most of the rest of my day. His wife, Patricia, was by his side the entire time, and every once in a while, she’d whisper to him to remind him of something from days long gone. At one point, she actually took the phone away from him and started answering my questions herself. She was Patty – a red-headed Irish girl – and she was the love of Don McMillan’s life. It was obvious then on the phone. It was obvious a few months later when I met Don and Patty face to face at the opening kickoff/book signing for Bearcats Rising – my first tome. 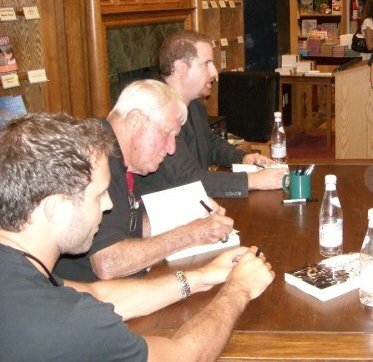 When my publisher and I were trying to figure out who we should invite to be guests at my first book signing – who would sign books along with me – we wanted to go with a current player (Dustin Grutza) and we wanted an older guy, a guy who had been around the program a very long time and who had a long-reaching perspective. Since I had such a great conversation with Don, we asked him if he could make it. He said he’d be glad to attend. I was honored to have him there with me, and he obviously was proud to be there as well, answering my queries during the free-for-all discussion between the audience and the three of us that led into the actually signing. Don was a guy who had much to say. He had served in WWII on the aircraft carrier San Jacinto, and he worked underneath the runway in the catapult, which basically shot the airplanes off the ship and into the sky. The San Jacinto was a magnet for Japanese kamikazes. Time and time again, the crew would see enemy pilots attempt to destroy the flight deck by crashing their planes into the ship, but they never finished the mission. But those guys got close. Close enough to where, one day, McMillan found a severed finger on the catapult track. Another day, he looked inside the gun mount and saw a lifeless Japanese body who looked ready to jump out and continue the fight. After the war ended, McMillan, a 24-year-old freshman, played quarterback at the University of Cincinnati. More than 60 years later, he told me his best tales and gave me so much help for my first book. He told a fantastic story, and from what I’ve gathered, he was a fantastic man. Today, one of his old teammates told me McMillan died last month at the age of 89. He left behind Patty and a wonderful, full life – he was a former high school football coach in Northern Kentucky who impacted many, many young lives – which he shared with his greatest love. When I heard the news, I went to the copy of Bearcats Rising I keep on my bookshelf, the one where I gathered signatures of all the former UC players who signed with me at various appearances, to look at what Don wrote. Don, thank you, my friend. The pleasure was all mine.